On Saturday I rode the 400km Utsunomiya event. Well, it actually started at 2AM Saturday and I finished well after midnight, so I guess I should say "on Saturday and Sunday". The start and finish were at the forest park west of Utsunomiya where the Japan Cup and other cycling races are held. The park is on the edge of hills that climb to the west and become mountains. But we would head Southeast, meaning that we did most of our descending (climbing) within a few kilometers of the start (finish). Briefing at the start - Lots of route changes to explain, especially one area where the path along the Tonegawa was closed for construction and a detour ended by a dark walk through a field. Ide-san (staff) gave me his "koma-zu" style cue sheet since I had brought only an earlier version. Otherwise, we stuck to a relatively flat course. Easy, right? Well, it would have been, except for wind and rain. Actually, mostly rain. The scenic Ushiku Checkpoint. 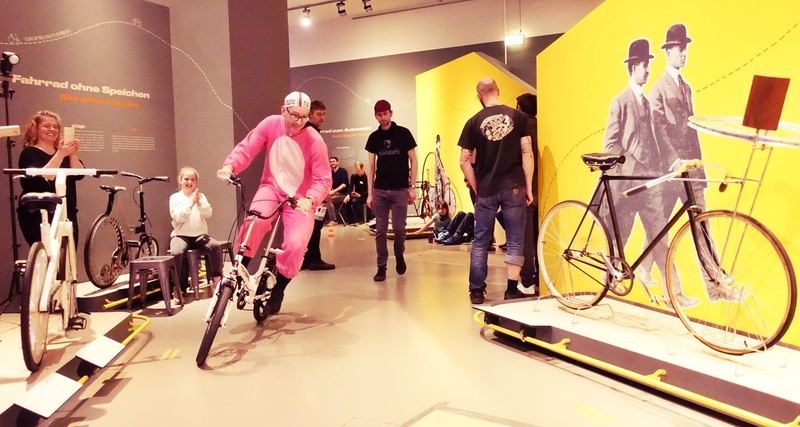 Next time I ride a course like this, I think I will try to play "count the convenience stores". The outbound leg was via Tsukuba, Tsuchiura, Kashima and to the tip of Chiba at Choshi. The return was via the Tonegawa. Something like 150 kms on or near the banks of the Tonegawa. I was warned by many of the participants that the headwinds coming UP the Tonegawa could be vicious, and would get stiffer in the afternoon and early evening when we would pass. In fact, the wind was not bad. We had an impossibly stiff headwind only for a few minutes crossing the river from N. to S. in Choshi, the entire weight of a western Pacific gale coming at us. On the return I faced stiff headwinds for less than an hour. No doubt I enjoyed (though did not notice) tailwinds on many other stretches. I noticed some other cross- head- and swirling-winds, but they were not sustained and not nearly as bad as what we come across on some rides in these regions. Choshi checkpoint views. I got a nice harbor views a few steps away ... but really did not want to spend any more unnecessary time in the rain to go back and get the photo after I had my warm food! Starting the return trip up the Tonegawa - looking back at floodgates in the distance on a bridge. What was bad? The rain. It started raining off and on just as I got home to pack on Friday evening. Other than some brief respites, it rained straight through from the 2AM start until about 2PM, after I was already on the return from Choshi. Another rider in another checkpoint convenience store. The Renovo -- a smooth ride. I was very happy to have the fenders this trip! And the dynamo lighting! No equipment issues the entire trip ... fenders keep the grit to a minimum even riding in rain for many hours. Not time now for a detailed equipment rundown ... later. The rain was very tough -- riding in standing water. The roads were generally nice and lightly traveled until we passed Tsukuba and Ushiku, where we had our second checkpoint at a Lawson. Through Tsuchiura, Kasumigaura, and Kashima and beyond, it was pouring rain and we were riding on heavily traveled roads, lines of traffic, zooming trucks. Ugh. The return leg, however, was great. Much of the return was on bike paths with NO traffic. The Tonegawa had some stretches of beauty. There were cows grazing on the banks, trimming the grass along the levy. There was even a water skiier. The rain ended around 2PM and we even got a little sun for sunset! I had planned to do this ride after a nice nap on Friday evening. Unfortunately, I got behind schedule and other plans intervened (a dinner with colleagues and a guest who I wanted to meet but who would leave town on Saturday). After a couple hours of riding, I started taking cat naps -- stop, drink coffee, nap 10-15 minutes, then continue. I did this at least 6 times over the entire event. It worked until the last 50 kms, when my pace slowed to a crawl. I had hours of spare time before the cut-off, and somehow could not push hard. I finally stopped at a 7-11 where the midnight shift clerks seemed very excited to see a gaijin rider. They said I was the 3rd or 4th rider to come by, and asked a million questions. They got out a folding table and wheeled out 2 desk chairs so I could rest INSIDE, in an aisle of the store, while I ate some pasta and drank MORE coffee. Another rider, Ohno-san, joined. Then another. We had a very subdued party in the aisle between the magazine rack and the cosmetic/toiletry section -- the first time I felt like more than a customer at a 7-11 convenience store in Japan, as they clearly departed from the rulebook. Somehow it seemed the perfect last stop for a ride that had featured nothing but convenience store food for 24 hours! 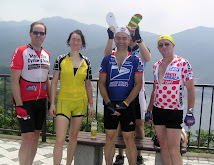 Thanks to Utsunomiya Audax for a course that was mostly nice, and in nicer weather would have been mostly easy. The course was not the most interesting, but at least the heavy traffic was limited to the Ibaraki stretches around Lake Kasumigaura. 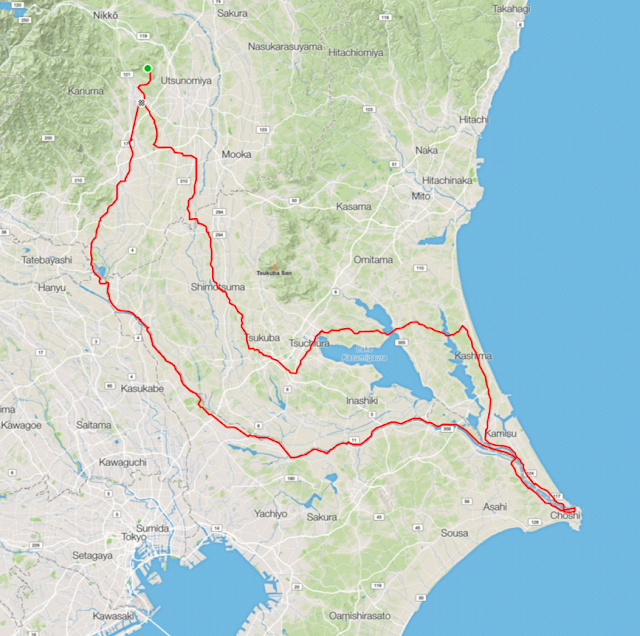 So if I compare this route with the Nihonbashi 300 I rode in early 2015, which took those same heavily traveled routes around Lake Kasumigaura in the other direction from Choshi, I would estimate that this time we had 100km out of 400km that was somewhat unpleasant, whereas on the Nihonbashi 300 maybe 175kms out of 300kms was so. This ride I would do again; the other, never. And if I were to design a course to/from Choshi, I would definitely use the Tonegawa path in one direction, and Kujukuri-hama and rural Chiba in the other. In any event, after a few hours on a bike path in the dry weather on the return, the rain was only a distant memory! Update: The 392 kms during a 24-hour period I captured on my GPS unit put me at #118 out of over 180,000 participants in Strava.com's "March Gran Fondo" ride challenge. Not bad ... though still less than one-half the 24-hour distance recorded by the #1 rider.